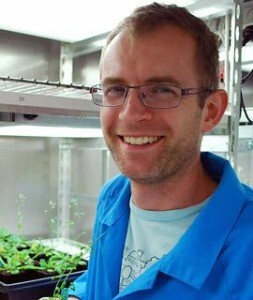 Originating from the UK, Dr Mark Waters joined the University of Western Australia in 2010 to work on the genetics of karrikin responses in Arabidopsis. Derived from burnt plant matter,karrikins are seed germination stimulants that resemble strigolactone hormones. Dr Waters’ research has elucidated early events in karrikin and strigolactone signalling, specifically involving the karrikin receptor protein KAI2. His work has established that KAI2 regulates diverse aspects of the plant life cycle, and may be a receptor for an unknown plant hormone. Evolutionary conservation of KAI2 suggests that KAI2-dependent signalling is a fundamental and ancient process common to all plants. Waters, MT, Scaffidi, A, Moulin, SLY, Sun, YK, Flematti, GR and Smith, SM (2015) A Selaginella ortholog of KARRIKIN INSENSITIVE2 functions in Arabidopsis development but cannot mediate responses to karrikins and strigolactones. Plant Cell, 10.1105/tpc.15.00146, In Press, accepted 18/6/15. Waters, MT, Scaffidi, A, Flematti, GR and Smith, SM (2015) Substrate-induced degradation of the α/β-fold hydrolase KARRIKIN INSENSITIVE2 requires a functional catalytic triad but is independent of MAX2. Mol Plant, doi:10.1016/j.molp.2014.12.020. Scaffidi, A, Waters, MT, Sun, YK, Skelton, BW, Dixon, KW, Ghisalberti, EL, Flematti, GR and Smith, SM (2014) Strigolactone hormones and their stereoisomers signal through two related receptor proteins to induce different physiological responses in Arabidopsis. Plant Physiol, 165, 1221–1232. Waters, MT, Scaffidi, A, Sun, YK, Flematti, GR and Smith, SM (2014) The karrikin response system of Arabidopsis. Plant J, 79, 623–631. Waters, MT, Scaffidi, A, Flematti, GR and Smith, SM (2013) The origins and mechanisms of karrikin signalling. Curr Opin Plant Biol, 16, 667–673. Waters, MT, Tiley, AMM, Kramer, EM, Meerow, AW, Langdale, JA and Scotland, RW (2013) The corona of the daffodil Narcissus bulbocodium shares stamen-like identity and is distinct from the orthodox floral whorls. Plant J, 74, 615–625. Rauf, M, Arif, M, Dortay, H, Matallana-Ramírez, LP, Waters, MT, Gil Nam, H, Lim, P-O, Mueller-Roeber, B and Balazadeh, S (2013) ORE1 balances leaf senescence against maintenance by antagonizing G2-like-mediated transcription. EMBO Reports, 14, 382–388. Bythell-Douglas, R, Waters, MT, Scaffidi, A, Flematti, GR, Smith, SM and Bond, CS (2013) The structure of the karrikin-insensitive protein (KAI2) in Arabidopsis thaliana. PLoS ONE, 8, e54758. Flematti, GR, Waters, MT, Scaffidi, A, Merritt, DJ, Ghisalberti, EL, Dixon, KW and Smith, SM (2013) Karrikin and cyanohydrin smoke signals provide clues to new endogenous plant signaling compounds. Mol Plant, 6, 29–37. Waters, MT and Smith, SM (2013) KAI2- and MAX2-mediated responses to karrikins and strigolactones are largely independent of HY5 in Arabidopsis seedlings. Mol Plant, 6, 63–75. Waters, MT, Scaffidi, A, Flematti, GR and Smith, SM (2012) Karrikins force a rethink of strigolactone mode of action. Plant Signal Behav, 7, 969–972. Waters, MT, Brewer, PB, Bussell, JD, Smith, SM and Beveridge, CA (2012) The Arabidopsis ortholog of rice DWARF27 acts upstream of MAX1 in the control of plant development by strigolactones. Plant Physiol, 159, 1073–1085. Scaffidi, A, Waters, MT, Bond, CS, Dixon, KW, Smith, SM, Ghisalberti, EL and Flematti, GR (2012) Exploring the molecular mechanism of karrikins and strigolactones. Bioorg Med Chem Lett, 22, 3743–3746. Scaffidi, A, Waters, MT, Skelton, BW, Bond, CS, Sobolev, AN, Bythell-Douglas, R, McKinley, AJ, Dixon KW, Ghisalberti EL, Smith SM and Flematti, GR. (2012) Solar irradiation of the seed germination stimulant karrikinolide produces two novel head-to-head cage dimers. Org Biomol Chem, 10, 4069–4073. Waters, MT, Nelson, DC, Scaffidi, A, Flematti, GR, Sun, YK, Dixon, KW and Smith, SM (2012) Specialisation within the DWARF14 protein family confers distinct responses to karrikins and strigolactones in Arabidopsis. Development, 139, 1285–1295.